Private transfer by car or minibus is probably the most convenient way to get to Laem Ngop (Krom Luang) Pier for Koh Mak. We can collect you direct from your hotel in Bangkok, Suvarnabhumi Airport, Don Mueang Airport, as well as Trat Airport, Pattaya, Ban Phe (Koh Samet), the Cambodian cities and borders. From hotels in central Bangkok, transfer time is around 4.5 to 5 hours with a couple of stops along the way. The first daily speedboat is at 10.30am Leelawadee, the last ones at 16.00, Panan and a new addition, 17.00, Suansuk, though that final boat is Friday, Saturday and Sunday only in low season, June to September. Prices cover all diesel and tollways needed. The cost of the speedboat tickets to or from Laem Ngop (Krom Luang) Pier is not included. We recommend 2 adults or 2 adults and child for the Camry style car, 3 adults or 2 adults and 2 small children for the larger Innova style car and 4 to 8 for the minibus. Passengers at Suvarnabhumi Airport are met at Level 2 Arrivals, Door 3 and all other meetings places are specified in advance. Payment for private transfers is with an initial deposit invoice via PayPal, with the balances due paid (in THB cash only) on the day of travel. You do not need a PayPal account to pay this, it can be done with any card. The deposit works as a guarantee, both to us and to you. If time does not allow for a deposit, then the transfers can sometimes be booked on trust, with the cost of the private transfer to or from Laem Ngop Pier paid direct to the driver on completion of your journey. If you would like to go ahead with a booking, complete the form below here and we will then get back to you to confirm your requirements and the price or simply use the standard Contact Us form and detail your booking that way. You can also email at explorekohchang@gmail.com. You should receive a reply within 24 hours, but also check your email spam folder, in case our reply gets shunted. 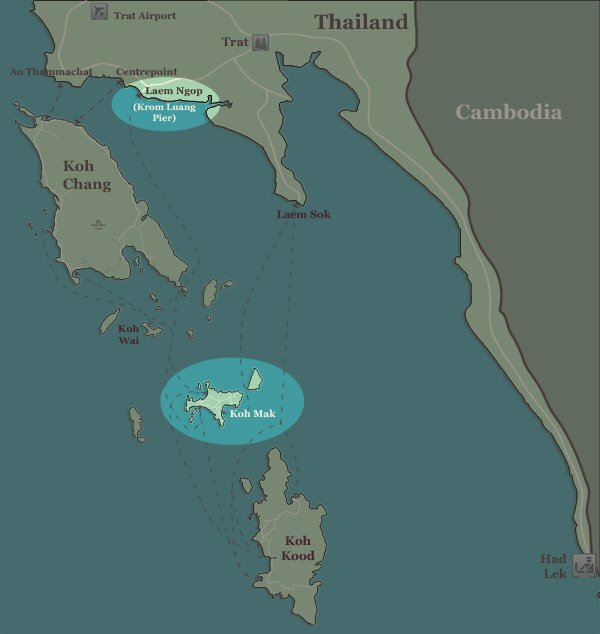 Koh Mak is popular and in peak season, busy, busy, so please do plan ahead and book in advance. Of course, we can handle last minute requests, but to ensure you are not disappointed, try and give us plenty of warning, the more time the better. In those peak periods, we will sometimes use a minibus for the car. Once we have agreed the details and price, we confirm availability and then email you the final arrangements and meeting points as required. Transfer prices for Koh Mak do not include the boat tickets to or from the island. 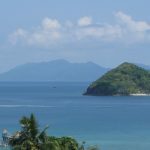 We can also organise all private transfers to Trat if you are staying a night or arriving too late to make the connections, prices on request. For Cambodia, a private transfer can be arranged between Laem Ngop Pier and the borders at Aranya Prathet, Had Lek and Ban Pakkad, with prices given below. We also offer a door to door transfer by private car or private minibus to and from your hotel in Siem Reap, Sihanoukville, Phnom Penh and Battambang. There is always a change of vehicle at the border. We normally only book transfers into Cambodia if you have an evisa, very easy to order from the official Cambodian government site. Coming the other way, you need a 07.00am or 07.30am start from Siem Reap to make the boats at either 15.00, 16.00 or 17.00 to Koh Mak. There is no need for a helper through Cambodian Immigration but be prepared for a long wait and queue to clear Thai Immigration – an hour upwards is the norm. This international transfer service does require a deposit as we pay the Cambodian drivers in advance. If travelling into Cambodia, payment for the balance (after the deposit has been taken) is at the border before you leave Thailand. If coming out from Cambodia, we ask for payment on arrival at your destination in Thailand. Our comprehensive round-up on travel to and from Cambodia is here. Please do contact us here for more information or a quotation, giving your full requirements including route, number of people, date of travel, adults and children, hotel names. You can also email at explorekohchang@gmail.com.